Marc Forgione has opened an Atlanta outpost of his beloved New York steakhouse American Cut. Located in The Shops Buckhead Atlanta, it offers a multi-level dining experience, including a rooftop terrace. Temptations for carnivores include the 40 oz. tomahawk chop. American Cut, The Shops Buckhead Atlanta, 3035 Peachtree Rd. NE, Atlanta, GA 30305, 770-415-9766. Castellucci Hospitality Group has moved its Sandy Springs pizza operation to the heart of the Emory area. With Edwin Molina still at its helm, Double Zero Napoletana reopened as Double Zero in Emory Village. Double Zero continues to be a destination for Southern Italian fare focused on pasta and pizza. But accents are borrowed from other traditions, such as the ancho chile marinade on the octopus or the grilled kale salad, but then it does come adorned with ricotta salata, bringing everything back to its origins. Double Zero, Emory Village, 1577 N. Decatur Rd., Atlanta, GA 30307, 404-991-3666. Char Korean Bar & Grill in Inman Quarter brings Korean barbecue ITP (inside the Perimeter). Ryan Catherall, son of Atlanta chef Tom Catherall, heads the kitchen of this establishment, founded by former Craft Izakaya general manager Richard Tang. Sous chef is Shaun Byun. Southern meets Korean in such dishes as kimchi deviled eggs and Korean fried chicken, both bar bites. Adventurous diners will want to try the veal brain spread. Another departure from an authentic Korean barbecue experience: Dessert, with molten lava cake and gelati. Dinner nightly. 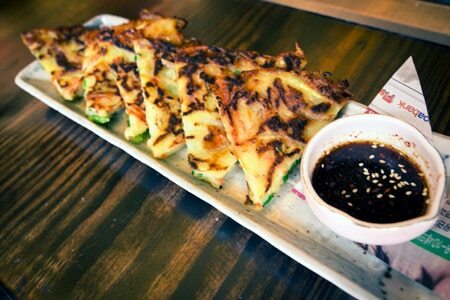 Char Korean Bar & Grill, Inman Quarter, 299 N. Highland Ave. NE, Ste. S, Atlanta, GA 30307, 404-525-2427. Tuk Tuk Thai Food Loft has reopened following a renovation to the kitchen and bar. The restaurant specializes in street fare, although its Monday night fried chicken is very popular. Tuk Tuk Thai Food Loft, Brookwood Village Shopping Center, 1745 Peachtree Rd. NE, Ste. Y, Atlanta, GA 30309, 678-539-6181.